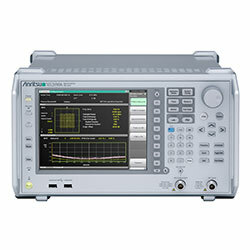 Anritsu Corporation has released software options for the Signal Analyzer MS269xA series that offers support for measuring the RF Tx characteristics of fifth-generation (5G) mobile communications base stations and terminals. The latest software options help signal analyses and measurement of RF characteristics by supporting 3GPP-compliant sub-6GHz uplink and downlink signals and specifying 1 Component Carrier (1CC) up to a bandwidth of 100MHz. Clients who have already invested in the Signal Analyzer MS269xA can immediately begin developing sub-6GHz wireless equipment using the same familiar operations, helping bring commercial 5G products to market sooner.